The call history on your iPhone can be pretty important since it is a record of all the calls you have made in a particular time. This record can come in handy when you want to call someone who is not in your contact lists but may have called you in the recent past. If you ever find yourself in a situation where you need to locate that one phone number but you have somehow lost the call history record, this article will come in very handy. Here, we will share with you some of the most effective ways to get your call history on your iPhone even if you don’t have a backup. With our solution, you can see a complete record of all the calls you have made in the past and therefore easily locate the single number you need. You may think that a data recovery tool is only useful to you when you have lost or accidentally deleted some of the items on your call history. With the right data recovery, you can also easily sort through the available call history on your iPhone, iTunes Backup or iCloud Backup to find the specific item that you need. We recommend iMyFone D-Back to do the work for you. It will scan your iPhone deeply to recover the call history on your iPhone even without a backup or help you gain access to your iCloud and iTunes backup to get your call history data from the backup files without restore. Step 1: From the main window, select “Recover from iOS Device” and then click “Start” to begin. Connect the iPhone to the computer using USB cables and wait for the program to detect the device. Click “Next”. Step 2: Select “Call History” in the next window as the type of data to recover and then click “Scan”. 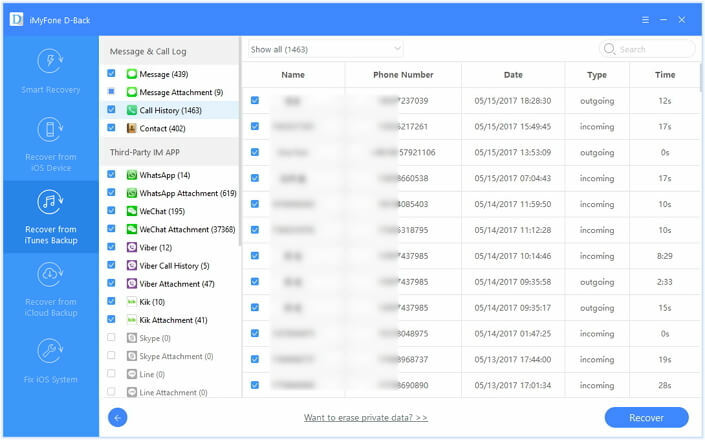 Step 3: When the scanning process is complete, you should see a list of all items on your call history on that device displayed in the next window. Select the items you want to recover and then click “Recover” to save them to your computer. You can choose to see only deleted items by checking “Show Deleted Data” which is advantageous when you have accidentally deleted your call history. D-Back enables you to easily gain access to your iTunes backup to view call history on iPhone without restore. This is particularly advantageous since you ordinarily can’t see what is in a backup file until you complete the restore process. The process of restoring the backup can also be quite problematic since it means that all the data on your device will be erased. Any new data on the device that may not have been included in the backup will be permanently deleted and unrecoverable. Step 2: From the list of iTunes backup files displayed in the next window, select the most relevant one and then click “Scan” to begin analyzing the backup file to find the call history data you are looking for. D-Back allows you to see exactly what is in the backup, thereby making it possible to select the type of data you want to recover. If you choose to restore from an iCloud backup, it is likely that some of the contacts may not be available in the backup. You will also need to begin by erasing all the data and settings on your device which could mean that you will lose the new data on the device that is not included in the iCloud backup. Step 1: From the main window, select “Recover from iCloud Backup” and click “Start” to begin. Select “Call History” in the next window and then click “Next” to begin. Step 2: Sign in to iCloud and then select the most relevant iCloud backup. Click “Next” to allow the program to analyze the backup for the missing data. This may take a while depending on the amount of data on the iCloud backup file. Step 3: Once the analysis is complete, select the call history you want to recover from the results page and click “Recover” to save them to your computer.